Ok i have some pictures for Elling and those who are interested in the milanese spaulders' movement. Please ignore the fact that i'm not wearing gauntlets, legs, etc - it's mild steel and the full kit now weighs close to 40kg - next step is replacing parts with hardened spring steel to lighten the load. No snags on the overlap as far i could tell. And this last image shows the problem i described where the extra plate on the spaulder is verrry close to the extra plate on the elbow which limits movement on the left arm. PS: Admin, If this conversation should be split off from the main topic please go ahead, i wasn't sure whether to keep posting here or make a new topic for it. 1) Reinforcement plates are for mounted combat, where your left side is basically your shield. For foot combat take these extra plates off (well, maybe you should leave them if you're fighting with something heavy and two-handed). 2) Proportions of your armor are a bit off. Cuirass seems to be too wide at the waist (well, for an average person at least). Vambraces are too wide at the wrists, they should be pretty snug-fitting. Maybe you should think about improving/changing your gambeson first. You don't need much padding under plate. And also thickness of the padding should vary, for example more on the waist and shoulders and less on the forearms. 3) Most likely plate thickness in your armor is "standartized", at least this is the case with most "production"-made armors. For example arms could be made entirely of 1.5mm steel. In your case I for example would make only elbows of 1.5 mm steel and use 1mm for vambraces and rerebraces. Vambraces are usually almost entirely covered by cuffs of the gauntlets, and rerebraces are hit very seldom. If you plan to use reinforcement plates, I would make elbows of 1mm steel as well. Also gauntlets are usually made way too heavy. 1mm mild steel is enough for milanese-style mittens (one such "survived" for about 7 years of full-contact fighting with one-handed swords before I finally made a substitution for it). I am now using 1.5 mm steel for plates that get hit most often and make the rest of 1mm. Even for fighting with two-handed weapons approximately half of the gaunlet can be made of 1mm steel. I recently started experimenting with high-carbon steel. Heat-treating is the way to go if you need the most durable thing, but even without heat treating it is harder than mild steel. 0.8 mm high-carbon steel (0.65% carbon) is roughly equal to 1mm mild steel. Hey Aleksei, Thanks for the advice. I use the kit for full contact sparring (only head is disallowed) and battles in the Netherlands and Belgium, from what i've heard those are still pretty civilised compared to some battles in Czech and Poland. Other then thickness i made some stupid, impatient decisions. I bought the cuirass off the rack since i was tired of wearing a chain skirt and this was nice and long with its 5 faulds, in the waist it should be a lot smaller, maybe i can get the armourer to take it apart and adjust the waist size to something a bit more fitting, probably will take 1-2 kg off easily. I think i'll ask a friend who is a smith if he can adjust the vambraces as you suggested, if he replaces the 'click' system with a leather strap i can tie it down much more snugly. The gambeson is a 8 layer linnen gambeson from Kokosh reenforced with some heavy duty leather shoulder patches (by me), it's not very thick since its only linnen but does weigh 2,8 kg. My gambeson (2 layers of cloth with stuffing) weighs only 1.6-1.7 kg. Probably not very historically accurate, but light and does its job well. 40 kg is really a lot! But not unheard of, Churburg CH19 is I think 49 kg with helmet, without mail. 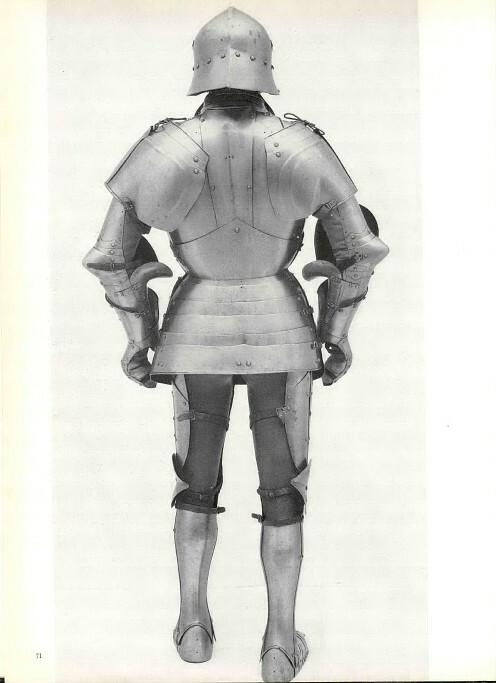 But it's much heavier than all the suits from Mantova, which are around 24 kg - Churburg suit is quite more substantial and for a very large man. And they are still heavier than German Sigismund of Tyrol suit, which is about 21 kg. @James Arlen Gillaspie: Do you have specifics on what's wrong with the Dino suit? I'm mainly interested in the cuirass. Does anyone have a more detailed picture of the backplate? The Dino suit incorporates a lot of real material, but heavily altered. The backplate is very odd; I can't seem to find a pic in uploadable format. Is this the one under discussion? Thanks James and Josh, much obliged. That's certainly a strange backplate, although I've this type of 3 piece construction on 16th century pieces.